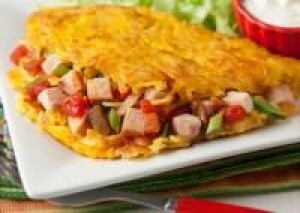 Filling for Southwest Omelet: Add 1-1/2 teaspoons chili powder to carton before adding hot water to hashbrown potatoes; fill each omelet with 1-2 tablespoons each, salsa, diced ham, and green onions; garnish omelet with cilantro and sour cream. Fill hashbrown potato carton to fill line with hottest tap water. Let stand 12 minutes. Drain any excess water. Mix hashbrowns and eggs in a medium bowl. Heat an 8-inch non-stick skillet, or a griddle, over medium heat. Coat with about 2 teaspoons oil; add 1/2 cup hashbrown mixture and spread to a 6-inch circle. Add Southwest filling on one side. Cook until top is set and bottom is golden brown, about 5 minutes. Fold unfilled side over filling and remove from pan. Repeat to make 5 omelets. Serve warm.